This week the U.S. Postal Service said that, thanks to a $20,000 incentive, nearly 3,800 postmasters had taken early retirement as of July 31, and about 300 will be retiring by the end of September, bringing the total to 4,100. Save The Post Office has compiled dozens of news articles from small newspapers that chronicled the lives and importance of those people on the communities they served. The stories show just how much the postmaster is valued in a small town and how sorry people are to bid farewell. "They provide a glimpse, into a world that’s being stamped out by POStPlan," Save the Post Office says, providing a sweet slide show of some of the departing postmasters and links (including a few that don't work) to the stories. Here's our favorite lede of the stories we were able to read, by John Christensen of the Chronicle-Express in Penn Yan, N.Y.: "Despite the widely held belief by his coworkers that he took his oath of office from Benjamin Franklin himself, and that he would never retire, Penn Yan Postmaster Leigh MacKerchar is about to do just that after a mere 30 years braving the rain hail and sleet, and the heat of the day and dark of night. Known as one of the friendliest faces in public service, he will be sincerely missed by all who have benefited from his commitment to that service and the satisfaction of his postal customers." (Read more) Most of the stories are from newspapers, but here is one from KOLN-TV in Lincoln, Neb., which covered a musical sendoff by the Riverdale Rounders, above, for Riverdale postmaster John Schafer. How much fracking impacts the availability of water depends on geography — "and on how you define impact," Malewitz writes. "So far, there has been little comprehensive research" on the topic. 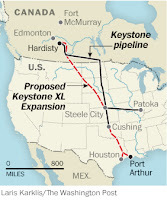 "Depending on the depth of the drilling, it can take anywhere from 2 to 12 million gallons of water to frack one well. Those numbers may appear staggering to laymen," but drilling companies prefer to compare them to those of the heaviest users. Chesapeake Energy, the nation’s second largest producer of natural gas, has circulated a fact sheet that states that the company’s water use amounts to just a fraction of agriculture's 82 percent of water use or 8 percent for public water supplies. "Environmental groups frame the issue differently," Malewitz notes. Western Resource Advocates estimated this year that drilling companies "were consuming enough water to meet the needs of between 66,400 and 118,400 households. The industry is researching ways to reduce water use and improve treatment and recycling, but with current technology, returning water to its natural cycle remains a daunting, costly task." See a related story from CNN/Money here. UPDATE: In his weekly address, President Obama says his administration’s has an "all-hands-on-deck" approach to the drought, and lists steps it has taken, including opening more federal land for haying and grazing; giving farmers, ranchers, and small businesses access to low-interest emergency loans; and providing assistance to get more water to livestock and restore land affected by the drought. The audio and video of the address will be available at www.whitehouse.gov at 6 a.m. ET, Saturday, August 11. The government slashed its expectations for U.S. corn and soybean production for the second consecutive month Friday, predicting what could be the lowest average corn yield in more than 15 years as the worst drought in decades grips major farm states. The Associated Press reports that Agriculture Secretary Tom Vilsack insisted that U.S. farmers and ranchers will remain resilient and the country will continue to meet demand as the global leader in farm exports and food aid. For a more thorough reading of the USDA Drought Monitor, go here. With populations moving out of rural areas, with some farmers finding it hard to press on against drought, with a lot of other obstacles we name daily, here comes Susan Crowell, editor of the Eastern Corn Belt's Farm and Dairy, to do a bit of cheerleading under the hot August sun. It's just so refreshing, we include a bit of it here, to wrap up the week. "There’s farm material in carpets, plywood, concrete sealer, the foam in automobiles, industrial coatings, adhesives, lubricants, and, of course, fuel," Crowell writes. "Last year, PepsiCo unveiled a new bottle that was made entirely of plant material (switchgrass, pine bark and corn husks, among other things). In Missouri, they’re even breaking down hog manure into a tarry product that can either be burned to generate electricity, or used as an asphalt binder. 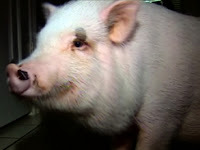 That’s right, the road to agriculture’s future is paved with hog manure. . . Not only do we need these new products and new opportunities, but we need that new blood and passion to continue to build our rural communities." A new study has found that deep injection of oil and gas wastewater appears to be causing more earthquakes than previously thought. Cliff Frohlich, a senior research scientist at the University of Texas' Institute for Geophysics, said that his findings should be taken seriously by drillers especially as the practice spreads to more densely populated areas. His work, reports Mike Soraghan of EnergyWire, was done around the Barnett Shale around Dallas to measure small earthquakes taking place near injection wells. His peer-reviewed study was published in the Proceedings of the National Academy of Sciences. The United Mine Workers of America does not plan to endorse either presidential candidate in the upcoming election, something that has not happened in memory, Amy Harder of the National Journal reports. The vice president of the UMWA's International Executive Board, Mike Caputo, right, told Harder that he wanted the organization to stay out of the fray. "I don't think quite frankly that coalfield folks are crazy about either candidate," he said. Obama and presumptive Republican candidate, Mitt Romney, are circulating ads and making stops in swing states with coal mines, such as Ohio and Virginia, to convince residents that they support the industry, Harder writes. 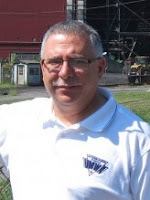 Caputo said it's "unusual" for the UMWA to pass on presidential candidate endorsement. The organization hasn't officially completed its endorsement selection decisions, but expects to by mid-September; it had endorsed Obama by May in 2008. 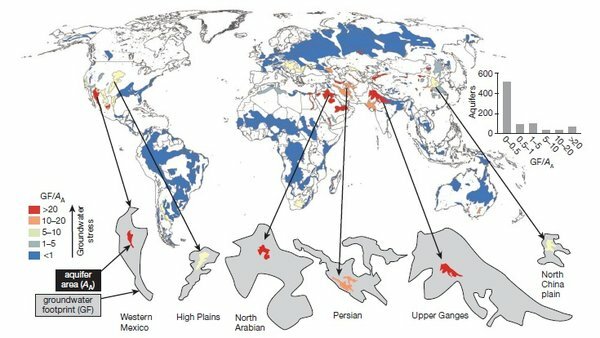 Humans in large agricultural regions are over-exploiting underground water, depleting it faster than nature can replenish it, a new study of international aquifer use concludes. Lead author and McGill University professor Tom Gleeson said the heavy consumption was "driven by a handful of areas," Morin reports, including the High Plains of the U.S. California's Central Valley had a groundwater footprint larger than its aquifer, but it was almost a third smaller than in the High Plains. About 80 percent of the world's aquifers had a footprint smaller than their size, but the major agricultural regions contributed to a global deficit, Morin reports. 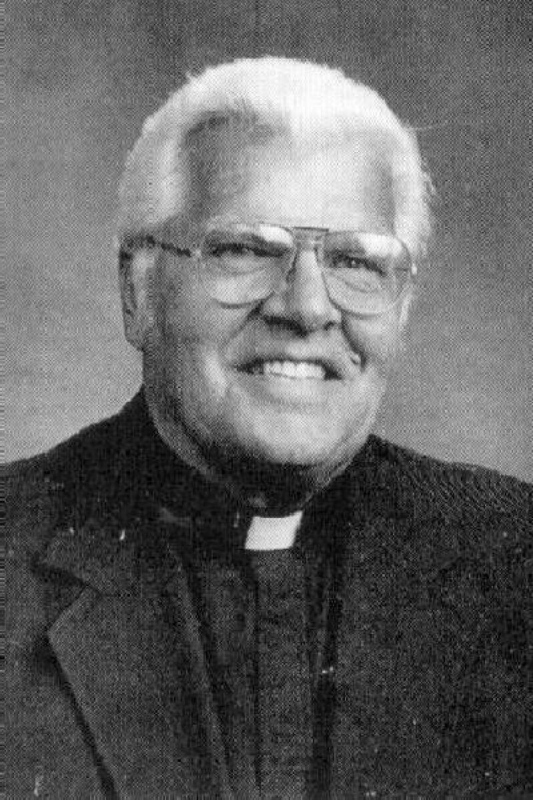 Monsignor Ralph Beiting, the Roman Catholic priest who founded the Christian Appalachian Project and served the people of Eastern Kentucky since World War II, has died. He was 89. Beiting was introduced to Appalachia when he traveled to the region on a mission trip in 1946. He had lived through the Great Depression and was familiar with living in poverty, but in Appalachia, he said during an interview with Story Corps, he had found "that there was another America ... the America of Appalachia." He said the poverty there at the time was the worst he had ever witnessed. Charles Compton of WEKU, the public station at Eastern Kentucky University, reports that Beiting was called in 1950 to start a Catholic church in Berea, just outside the Appalachian coalfield, and though his reception was not warm, he continued to "spread the faith and raise money" to build more churches throughout Eastern Kentucky. In the 1950s, Beiting launched a summer camp, Cliffview Lodge, that offered recreation and fellowship to boys from poor families. In 1964, the camp became the Christian Appalachian Project, which Beiting declared would "be a group that would roll up our sleeves and get the job done." 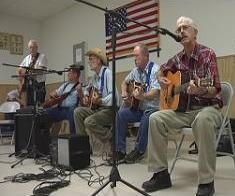 It expanded its work to a variety of projects to help the Appalachian poor. Beiting served as pastor of parishes in the Berea region until 1981, when he transferred to Eastern Kentucky, where he founded and/or constructed 20 churches. He served as CAP's president until 1986 and was chairman until 1999. Here are links to three videos of Beiting and Father Terry Hoppenjans talking about their work. The Environmental Protection Agency issued its final rule aimed at reducing emissions at the largest single source of haze-causing pollution in the U.S., the Four Corners Power Plant in northwestern New Mexico. The agency says plant operators can either reduce nitrogen oxide emissions by upgrading five generators at the plant or permanently shut down three and install pollution controls on the two others. Either move would cut emissions that can limit visibility at several Western national parks by 80 to 87 percent, reports Felicia Fonseca of The Associated Press. Regional EPA Administrator Jared Blumenfeld said reducing emissions is a "commonsense approach" that will improve air quality at parks that are "crucial to the economy of Four Corners." Arizona Public Service plans to close three units and install pollution controls. The plant provides electricity to about 300,000 homes in New Mexico, Arizona and Texas. What would happen if human weren't in the field any more to pick the most delicate of crops -- fruits in orchards or the grapes for premium wine? You know, the high-value stuff. And, let's go one more, what if humans were removed one more step: What if something could target the protective pesticide spray so it only touched the foliage and never once touched the fruit? That's be kind of amazing. No, that'd be a robot. And it's a new project that’s part of the European Union Seventh Framework Program (FP7) called Clever Robots for Crops, or "cRops." 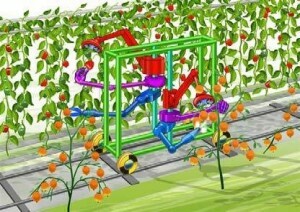 According to Forbes magazine contributing writer Jennifer Hicks, these robots will be able to detect the fruit's ripeness, then grasp and softly detach only ripe fruit. 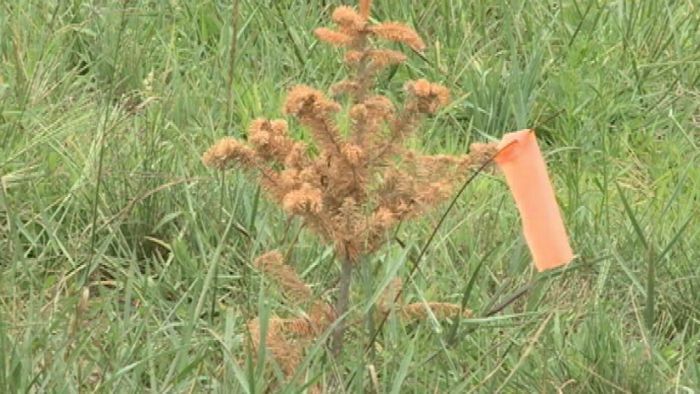 The robots would also be able to reliably detect and classify obstacles and other objects to enable successful navigation and operation in plantations and forests. "Projects like cRrops are significant because they can accelerate sustainable development of agriculture," said Catherine Simon, founder and organizer of Innorobo, a robotics conference set for 2013. Hicks' sources say it will take at least five more years before the whole thing could be commercialized. So why is Europe moving so slowly? “One of the main reasons is simply because robotics is still in an early stage of maturity and we continue to see projects coming out of academia, government or EU commissions,” said Simon,“Europe needs to make the shift from projects to product faster like the United States if we want to remain a leader in the the field of robotics." 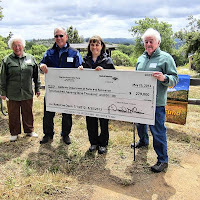 To pull itself out of poverty, the Maidu Indian Tribe of California in 2002 applied to build an off-reservation casino about 35 miles south of the few acres of reservation land where a handful of the tribe's people live in broken-down trailers. The federal government has approved the plan, but the final decision rests with California Gov. Jerry Brown, who is expected to decide on the fate of the planned Enterprise Rancheria casino and another tribe’s off-reservation proposal by an Aug. 31 deadline. But, reports Norimitsu Onishia of The New York Times, "Plans for the two casinos are drawing fierce opposition and last-minute lobbying in the state capital from an unexpected source: nearby tribes with casinos that they say will be hurt by the newcomers. Leading the fight against Enterprise is the United Auburn Indian Community, whose casino, Thunder Valley, has become one of America’s most profitable and has brought the formerly destitute tribe unimaginable riches." How unimaginable? Onishia reports that "with 80 percent of its revenues coming directly from gambling, Thunder Valley is so profitable that it has transformed the lives of its owners, the 400-member United Auburn tribe, most of whom received welfare benefits until the casino opened in 2003. The tribal council has provided housing for members, built group homes for troubled children and connected residential areas to water and sewer systems. All members receive free health care and dental benefits. Children making the honor roll receive hundreds of dollars in incentives. The tribe’s 200 adult members each get a share of the casino’s revenues, which local news media have reported as $30,000 per month, and which industry experts have estimate is more. Douglas G. Elmets, a spokesman for the tribe and a former White House spokesman during the Reagan administration, said only that members did not need to work for financial reasons, but that many did in tribal affairs." A dispute has erupted in Nebraska between two previous allies -- environmentally outspoken and traditional Democratic activist Jane Kleeb and water expert and all-around green guy James Goecke. 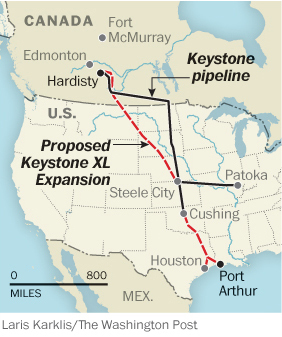 The public fight is over Keystone XL, the already much disputed 1,700-mile steel pipeline that would carry heavy, low-quality crude from Canada’s oil sands to refineries in Texas. At issue, writes Washington Post reporter Steven Mufson, is whether the pipeline would pose a threat to the massive Ogallala Aquifer, one of the world’s largest underground sources of fresh water which sits firmly under Nebraska and likely holds enough water to cover the country’s 48 contiguous states two feet deep. A lot of what you think about crime, writes John Roman of the Urban Institute, is just not true. Too much television, too many headlines and too much thinking it was better when you were little have made feel unsafe. "Fact: if you are under 40, on average you are safer now than you have ever been," Roman reports. Suburbs are safer than cities, yes, but "The trend is better for cities than suburbs. At the peak of the crime wave in 1991 there were 138 homicides in Prince George's County and 479 in Washington, D.C. Last year, there were 82 homicides in PG (down 40 percent) and 132 in DC (down almost 75 percent)." Roman notes that the public also likes to believe that "there are two typical types of offenders: One is the brilliant loner psychopath who commits serial crimes and can’t be caught without the aid of large task forces, luck, and equally brilliant loner detectives. Fact: most criminals are far less educated, poorer, and sicker than the average American. Type two is the ruthless, soulless gang-banger who can only be contained (but never defeated) by armies of police. Fact: gang members are typically teenagers, generally in a gang for about a year before voluntarily leaving, and commit as many crimes against their fellow gang members as others. " As more Americans have left Midwestern communities in recent years, those places have lost the vitality and life of more than 2,100 public schools. As a result, Steve Rich of USA Today reports, school districts and whole communities have scrambled to survive. From 2006-07 and 2010-2011, according to a USA Today analysis of U.S. Department of Education data, the population gains were largely in California, Texas and Arizona, which added 1,133 schools. The loss is not just physical. The mass closings, which often see students moved to other buildings in a district, can affect home prices and businesses and often take an emotional toll on residents. "It's like losing the soul of the community," said Terry Ryan, vice president for Ohio Programs & Policy at the Thomas B. Fordham Institute, a center focused on education. Further analysis of the data, writes Rich, found much of the Midwest's school loss came in three states: Michigan, Minnesota and Ohio. The schools that closed during the five years studied had served nearly 1.5 million students. President Obama told the Agriculture Department today to authorize another $30 million to help crop and livestock producers damaged by the nation's worst drought in 50 years, and announced some other steps intended to mitigate the drought's impact, including a program to help commercial truck drivers make deliveries to drought-stricken areas. Obama said the Small Business Administration "is working with other government agencies to connect even more eligible farmers, ranchers and businesses with low-interest emergency loans as well as counseling and workforce programs," and "The National Credit Union Administration is allowing an additional 1,000 credit unions to increase lending to small businesses." 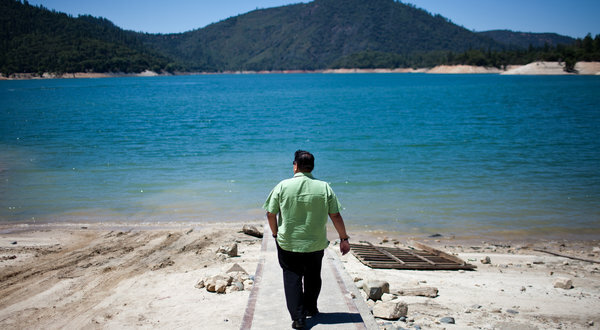 The president said the White House is actively soliciting other ideas for drought relief. also called on Congress, which just started a five-week recess, to pass a Farm Bill with drought relief. "That's the single best way to help rural communities both in the short term and in the long term," he said. For the White House's drought "fact sheet," click here. As students and teachers return to school, food-service directors are working to implement the new federal school lunch regulations that take effect Oct. 1 -- a story for any local news outlet, since it affects almost every student. Meanwhile, another school food program is up for debate. Congress is deciding whether frozen, canned and dried produce should be included in the Fresh Fruit and Vegetable Program. House Republicans say yes, to save money and make a wider range of options available year round. But the Senate is pushing to keep the program limited to fresh fruit and vegetables only. The argument — or food fight, as Dina ElBoghdady of The Washington Post calls it — has trade and other groups weighing in. "If the goal is to expand and improve upon childhood nutrition, it doesn't make sense to limit the kinds of fruit and vegetables that schools serve," said Corey Henry, a spokesman for the American Frozen Food Institute. "Let the schools decide." But Sandi Kaur, acting director of nutrition services at the California Department of Education, disagrees, saying "it's the fresh that makes this program unique." There are now 456 Amish settlements, compared to just 179 in 1990, according to the census, Science Daily reports. If the growth continues at its current rate, there could be more than 1 million Amish people living in more than 1,000 settlements across the U.S. by 2050, which would "bring economic, cultural, social and religious change to the rural areas that attract Amish settlement." Researchers predict Amish will buy land vacated by farmers, but "the availability of farmland might not keep pace with population growth," forcing many Amish men to seek non-farm work, including woodworking and construction, which could increase land prices and enhance local economies. Many local officials in rural communities are not opposed to natural-gas drilling, but they are opposed to drilling close to homes, schools or hospitals. Citizens are increasingly turning to their city and town governments to help fight encroachment of drilling rigs when they feel state regulations aren't strict enough to control the drilling close to their towns. Jim Malewitz of Stateline reports the trend is "worrying" industry representatives and state officials who want to expand the "industry's reach." At least 246 cities or towns in 15 states have passed laws restricting drilling on local land, according to Food and Water Watch, an environmental group. Malewitz reports some of the ordinances are "merely symbolic" because those towns don't sit atop gas reserves. More than 90 cities or towns in New York have passed resolutions addressing gas drilling, 14 in Pennsylvania have passed regulations, and some in Colorado are doing the same. A Pennsylvania appellate-court panel recently struck down a new state law that barred local officials from using zoning to prohibit drilling in certain areas. UPDATE, Sept. 4: Julianne Couch wrote a nice feature story for the Daily Yonder about the program. Rural areas across the country could learn from Kansas about how to repopulate and revive economically struggling communities. 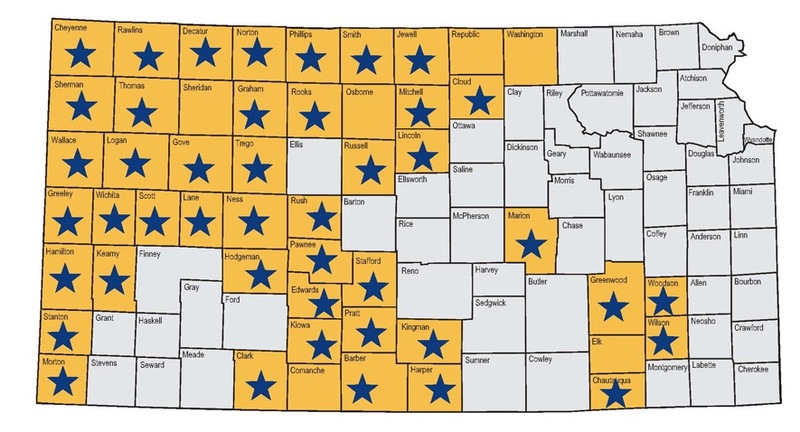 The state started its Rural Opportunity Zones program last year in 50 rural counties: mostly poor, agricultural communities that had lost about 10 percent of their population since 2000. If college graduates move to some of those areas (with stars on map) for at least five years, $15,000 of their student loans are forgiven. Hillsboro Development Corp. Executive Director Clint Seibel told Benjamin Reeves of International Business Times that rural Kansas needs more young people. "We've done a great job educating our young people in rural America and then we buy them a suitcase and send them to a major university and never see them again," Seibel said. The program draws about one new applicant per day. Almost 75 percent of applicants, aged 25 to 35, meet program requirements, and most are from Kansas, with a large portion coming from Nebraska, Oklahoma and Colorado. But others have come from California, New York and Florida. A new University of Tennessee study highlights the strengths and weaknesses of Appalachian rural communities by examining the challenges facing economic and community development in 10 Appalachian counties in eight states from Pennsylvania to Mississippi. The report explains how local governments, agencies and community organizations respond to those challenges, and shows how five formerly distressed counties improved their local economies as an example to other communities. "Location is often a key factor in a county's success," the report found. Non-distressed counties "generally benefited" from their proximity to urban areas. Attitudes about local economy, entrepreneurship and business development also contribute to a county's success, according to the report. The study says that education is very important to development in Appalachia. Improvement to local schools and community colleges, in particular, has boosted local economies. 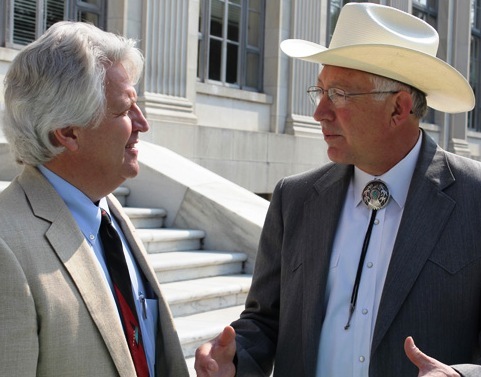 Partnerships with universities also "brings important benefits to Appalachian communities." In the midst of the soul-killing drought, the mind-numbing Farm Bill fight and the constant debate about the use of pesticides, here's some news that just might make the day in farm country: Enrollment in agricultural colleges is downright booming. Why? Because, university officials tell Jens Manuel Krogstad of USA Today, "ag-related college majors appeal to both the heart and mind of a student." Better maybe still, students feel that with the degree they can help address such global issues as hunger and obesity. "There's a better understanding that when we use the term agriculture, it's not all plows and cows," said Ian Maw, vice president for food, agriculture and natural resources at the Association of Public and Land-grant Universities in Washington, D.C.
Also, students see a clear path to a job after graduation. "At traditional agriculture powerhouses such as Penn State, where enrollment is up more than 40 percent since 2004, career preparation can include cutting-edge research in areas such as plant breeding or genomics," writes Krogstad. "Schools in more urban regions draw students interested in local foods and healthy eating. Farmland prices have tripled in the U.S. in the past decade, and corn prices have doubled since mid-2010, and the high-paying jobs that follow are catching students' attention in a down economy, Maw said. 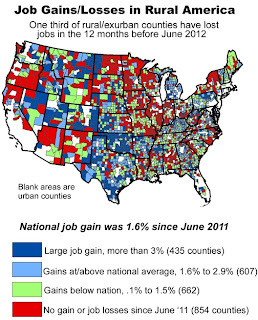 In real numbers, that means that in rural counties, there are 194,000 more jobs this June than June a year ago. In exurban counties, there are 201,000 more jobs and in urban counties there are 1,874,000.
check for the state three months ago. 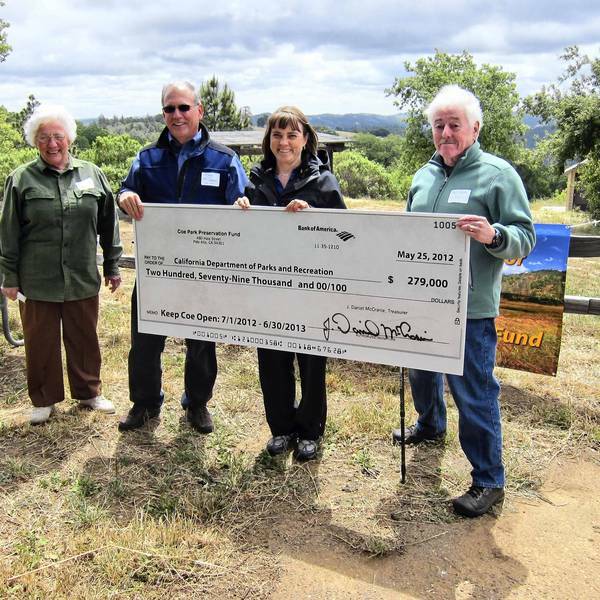 When cash-pinched California officials announced last year that they couldn't afford to keep 70 California parks open, neighbors held bake sales, children collected nickels, cities dug into their reserves, and nonprofits rallied big donors. Most of those 70 parks at risk were in rural areas where fundraising could be a monumental, heartbreaking task anyway. With the recent disclosures of a largely unknown $54 million pile sitting in state parks accounts, the Los Angeles Times reports that the can-do spirit has been replaced by a how-could-they indignation. The fallout from the revelation, so far, has been the forced resignation of the state's parks director who many believe knew, or should have known, about the fund. Now, Steve Chawkins and Chris Megerian report, local governments are demanding their money back, "saying they were duped at a time they could little afford it." Ventura County alone is asking for an immediate refund of $50,000 which it desperately needs for a sewer line. Kentucky's leading environmental lawyer has turned down an award from the U.S. Office of Surface Mining and Reclamation and Enforcement with a letter that amounts to an indictment of the Interior Department agency and its congressional overseers and funders. 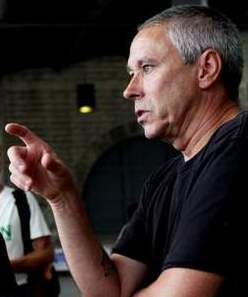 "The promises made to the people of the coalfields remain largely unkept," 35 years after the federal strip-mine law was enacted and 55 years after efforts began to pass it, Tom FitzGerald of Louisville told Director Joe Pizarchik in declining to accept the agency's first Environment, Community, Humanity and Ownership Award, which OSMRE says is aimed to honor someone "who promotes the ideals of the federal Surface Mining Control and Reclamation Act of 1977 while also advocating for the “appropriate balance between meeting the nation’s need for energy without compromising protection of people, the environment and the surrounding community." "The law promised to curb abusive mining practices with the goal of protecting landowners, the public, and the environment from the adverse effects of surface coal mining operations. In substantial measure, these promises have been betrayed," FitzGerald wrote. "Though Congress intended that the choice of technology would follow, rather than dictate, environmental protection, the coal industry has over the decades systematically replaced the workforce with larger machines more indiscriminate to the terrain, and key concepts in the law have been weakened by regulatory interpretations in order to accommodate this shift." FitzGerald said the Obama administration "has done precious little of substance" to undo the damage by 30 years of OSMRE management that has been hostile or indifferent to the intent of lawmakers who wrote the bill that became law Aug. 3, 1977. He cited examples, including lack of timely reclamation, mis-classification of mountaintop-removal mines as area mines, and ignorance of the law's requirement that mined land be restored to its approximate original contour. His letter is here. "OSM takes seriously Mr. FitzGerald’s concerns," agency spokesman Chris Holmes told James Bruggers of The Courier-Journal, noting that Pizarchik said "OSM and its state regulatory partners can and should do better. The theme of the director’s speech was that 35th anniversary … is a time to recommit to protecting the nation’s economy, energy supply, and environment, and ultimately, the people who live and work in coal country." 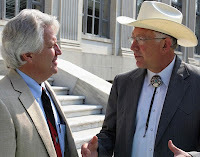 FitzGerald told the Louisville newspaper that he didn't blame Pizarchik, but Interior Secretary Ken Salazar. Bad, yes, but human attendance has shriveled, to -- the combination, organizers say, of miserably hot weather and larger, overwhelming concerns back home on the farms. 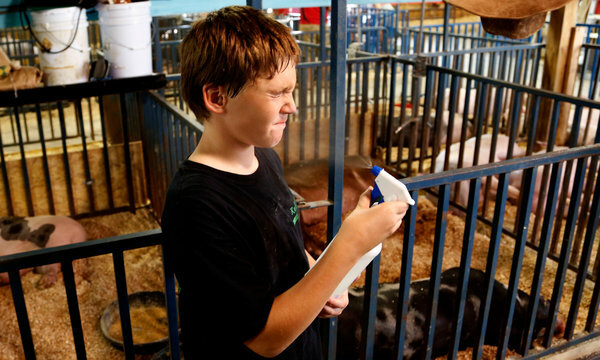 “It was the roughest I’ve seen,” said Gary Shemanski, facilities manager at the Johnson County Fair in Iowa. There, he told Davey, attendance fell, four rabbits perished in heat that exceeded 100 degrees, and a beloved, final fireworks display was canceled for fear of setting off a blaze in the bone-dry county.